In EnviroInsite, the term Geology refers to the local soil observations that are observable at a borehole scale. These observations are unlikely to be clearly continuous between boreholes. To impose consistency on the hatch patterns used to represent particular units between different plots, the geology hatch patterns are set at the document level. To set the hatch patterns, select Edit> Format> Geology from the main menu. Note that for each unit, two hatch patterns may be selected. 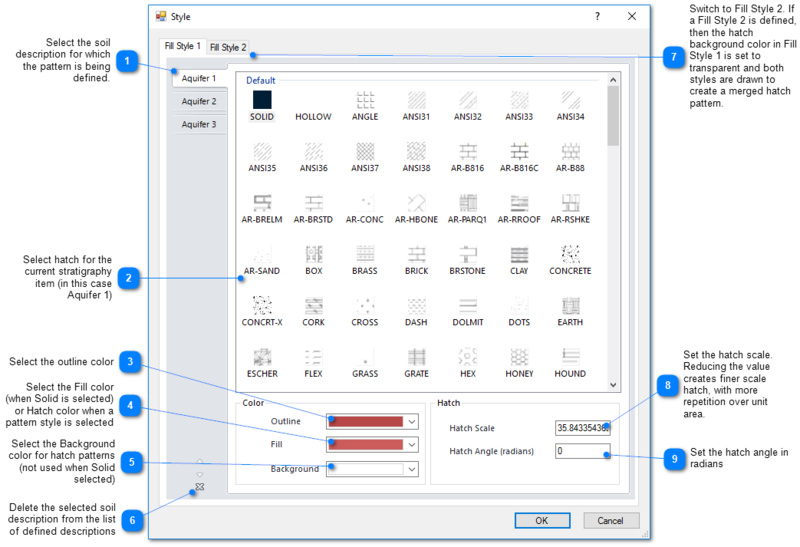 If anything other than SOLID is selected for Fill Style 1, then the final printed hatch pattern will be the combination of the Fill Style 1 and Fill Style 2 hatch patterns. 1.Select Edit> Format> Geology from the main menu. 2.For each lithology, assign a Fill Style, Outline Color, Fill Color/Hatch Lines, Background Color, Hatch Scale and Hatch Angle. 5.Navigate to the desired folder, name the XML file, and click Save.